I read this article and found it very interesting, thought it might be something for you. The article is called Jaitley’s $13-Bn For Water Plan That’s Failed 66 Million Farmers and is located at https://archive.indiaspend.com/cover-story/jaitleys-13-bn-for-water-plan-thats-failed-66-million-farmers-26128. A two-decade old Central programme to finish incomplete irrigation projects has failed 66 million Indian farmers and halted the economic progress of 350 million Indians, according to an IndiaSpend analysis. Finance Minister Arun Jaitley, in his budget speech last month, said the government would spend Rs 86,500 crore ($12.7 billion) over the next five years to irrigate eight million hectare of cultivated land. Only 65 million of 140 million hectare, or 46%, of Indian farmland is irrigated since independence, according to Agriculture statistics released in 2014. The World Bank, however reports 36% of irrigated land in India. Jaitley intends to spend the Rs 86,500 crore on the Accelerated Irrigation Benefits Programme (AIBP)—quadrupling annual spending—rolled out in 1997 to fast-track existing and new irrigation projects with funding boosts to states. As much as Rs 72,000 crore ($10.5 billion) was spent over 20 years since 1997 on the AIBP, according to Water Resources Ministry data. The Central Water Commission reports a spending of Rs 53,000 crore till 2015. Our analysis of the AIBP reveals multiple failures, something that its architect recently acknowledged. Only 26% of target met: Till 2008, with Rs 34,000 crore ($5 billion) spent, AIBP could irrigate no more than five million of 19 million hectares it intended to—that’s 29%—according to this audit report (2010) of the Comptroller and Auditor General (CAG), the auditor of the central government. As of March 2014, 9.5 million hectare is irrigated by AIBP projects, as per the latest data. Irrigation efficiency drops 55 percentage points: The efficiency of irrigation—actual land watered as percentage of capacity created—dropped from 84% during the VII Plan (1985-1990), to 29% during the XI plan (2007-2011), according to the CAG. Of capacity created, only 33% of farmland got water: Of the irrigation capacity created by the AIBP during 2007-11, only a third of farmland actually got water, the Economic Survey 2015-16 said. “The Accelerated Irrigation Benefits Programme has failed to achieve its targeted objective of accelerating completion of large irrigation projects and delivery of benefits of irrigation water to farmers,” the CAG report said. The finance minister’s announcement of Rs 86,500 crore ($12.7 billion) for AIBP for the next five years quadruples the annual spending on AIBP from Rs 3,650 crore per year over the last two decades to Rs 17,300 crore per year over the next five years. Source: Water Resources Ministry; Union Budget 2016-17. The budget for 2016-17 has set aside Rs 7,308 crore for irrigation—Rs 1,877 crore for AIBP, Rs 2,340 crore for micro-irrigation, Rs 1,500 crore for watershed management, Rs 1023 crore for irrigation and flood control and Rs 568 crore for other spending. To meet Jaitley’s AIBP target, spending will need to soar over the next two years of his government. If anything, the AIBP has actually slowed the efficiency of irrigation. The AIBP started with Rs 500 crore in 1996-97. 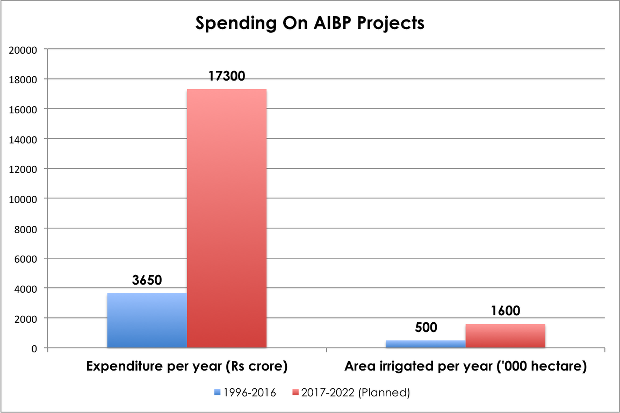 In three years, by 2000, non-AIBP spending on irrigation touched Rs 700 crore, while AIBP alone spent Rs 1,440 crore. AIBP peaked in 2008-09 with Rs 7,600 crore funding, with total irrigation spending by the central government crossing Rs 10,000 crore. Source: Union Budgets of India; Figures in Rs crore. Note: IWMP – Integrated Watershed Management Programme aims to restore the ecological balance by harnessing, conserving and developing degraded natural resources such as soil, vegetative cover and water; Non-plan spending majorly includes administrative and salary expenses. With every five-year plan, the gap between irrigation potential created steadily increased, as IndiaSpend reported earlier. Instead of increasing, irrigation utilisation fell after the introduction of AIBP, according to the Economic Survey 2015-16. Source: Economic Survey 2015-16 of India; Report:Raising Agricultural Productivity and Making Farming Remunerative for Farmers, NITI Aayog. The irrigation potential utilised—water used for farming as percentage of irrigation capacity created—was 85% during the VIIth and VIIIth Plan, falling to 50% during the IXth Plan, 70% during the Xth Plan and 29% during the XIth Plan. Planning as an economic philosophy has now been discarded. It was not just the CAG that pointed out the AIBP’s declining efficiency; this Finance Commission report did as well. “At the end of Xth plan (2007), the cumulative irrigation potential utilisation was about 84%. This has been on decline (sic) particularly since 1990s,” said the Finance Commission report. At the end of 2012, this efficiency was down to 77%. Of 294 AIBP projects started till 2014, about 142 are complete. Many are riddled with cost overruns and many have been under construction for two decades. Even after irrigation capacity has been created—some dams have been built—states stall the progress, by failing to build canals that would actually take water to the fields, according to the CAG report. The 55-percentage-point decline—over 15 years—in irrigation utilised stems from improper operation and maintenance, incomplete canals, violations in cropping pattern and diversion of irrigated land for other purposes, according to the Economic Survey, 2015-16. Of 138 million farmers in India, 66 million depend on increasingly uncertain rains. Extreme rainfall events in central India, the core of the monsoon system, are increasing and moderate rainfall is decreasing–as a part of complex changes in local and world weather–according to a clutch of Indian and global studies reviewed by IndiaSpend. While AIBP increased the flow of money from central government, farmers remain deprived of water. “The government needs to ensure the achievement of targeted objectives of AIBP by focusing on the completion of existing projects rather than taking up fresh projects, and ensuring utilisation of potential already created, rather than creating new potential, so that the huge funds invested are put to productive use,” said the CAG audit report of 2010. The importance of irrigation is rising, as India’s agriculture growth contracted 1% in the October to December quarter of 2015 and grew only 1.1% in the financial year 2015-16 (advance estimate, obtained by extrapolation of latest available data); back-to-back droughts, the worst in 30 years; winter (rabi) crop sowing dropping below 60 million hectares, the worst in four years; and thousands of suicides by farmers nationwide. Maharashtra has 252 irrigation projects supported by the Accelerated Irrigation Benefits Programme–more than any other state. Till 2012, only 138 of them were complete. With a target to irrigate 12.2 lakh hectare, Maharashtra could irrigate only 6.5 lakh hectare till 2014. Irrigation potential created is 50% below the target, and that utilised is worse than that, which means, eventually, dams may—or may not—get built, but water reaches less than half of the intended recipients. 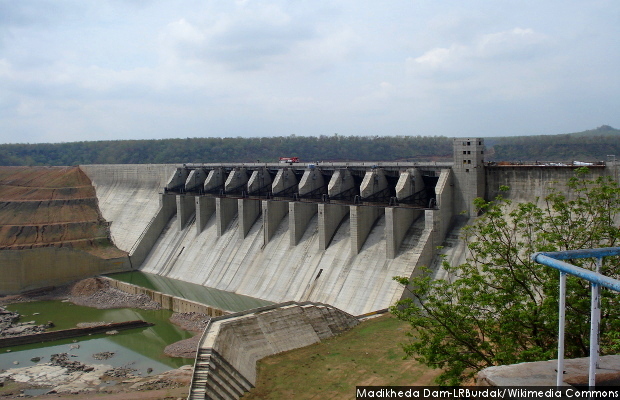 In all, Maharashtra has 1,845 large dams, more than the total in 25 states, except Gujarat, Karnataka and Madhya Pradesh. In addition to its AIBP failures, Maharashtra’s water-resources department fell short of its irrigation targets by 50% in 2011, despite 3,712 completed/ongoing projects (98 major, 259 medium and 3,355 minor irrigation projects), said this 2014 CAG report on the state’s irrigation projects. “As against the planned irrigation potential of 66 lakh hectare, and potential of 48.26 lakh hectares created in the State, the irrigation potential utilised as on June 2012 was only 32.51 lakh hectares, i.e. 50% of planned capacity,” according to the CAG report. The story has been updated to reflect the correct figure of eight million hectares instead of 80 million in second paragraph. Is the continued support for large projects an indication of the mindset of the bureaucracy? Minor irrigation projects, rainwater harvesting, drip irrigation…these provide better RoI than large irrigation projects. Terrific work for this article! Notable is the relatively small sum spent on water harnessing compared to the construction heavy “capacity” creation. The chief glitch has been the availability of water – water harnessing will require more distributed, people interaction intensive programmes – not designed for big contracts. As a result, the grand initiative becomes a keynesian dig-the-trenches effort even if there isn’t more water going around. Inevitably the actual irrigation done (capacity utilisation) has dropped. Or maybe I’m just being cynical ! I am sure this budgetary allocation is a good sign since in this government’s lifespan, the implementation has been meticuolous. The budget speech lays out a goal to irrigate 80.6 lakh hectares of land over the next 5 years- not 80.5 mn. Hence its a 12% increase over the current base. The story has been updated to reflect correct figures. Thank you. The heading seems to be willfully distorted. No major irrigation project can be completed in two years. This is a failure story of the previous decades. In any case, if storage places are constructed, one day or the other, there will be heavy rains and water will get stored.